A few weeks ago we posted a list of video providers that were a good fit for healthcare associations. As promised, here is a follow-up post with a list of enterprise video providers for continuing education. For this article, many enterprise video providers are intentional excluded. We’re specifically listing providers that focus on education and have features appropriate for large healthcare associations and academic medical centers. What’s the difference between video hosting and an enterprise video provider? Pre-built integrations including LMS, CRM, as well as video-specific tools. Brightcove is targeted at publishing, marketing and internal training and does not address the education market specifically. But the are the market leader, so we’ve included them for that reason. Brightcove claims they have the fastest video player on the market and offers features such as live streaming, partner integrations for additional features, and ads and monetization. Interactivity features are provided by partners at an additional fee. The management interface for the enterprise video suite is clean and easy to use. However with a focus on publishing, marketing and corporate use, healthcare continuing education providers such as associations and academic medical centers may want to look for a product better aligned with their needs. Primarily focused on higher education, Echo360 has recently moved into the realm of continuing medical education. Echo360 offers features such as learning and behavioral data, classroom enagement tools such as note taking, asking questions, social discussions; lecture capture, learner-response polling, screencasting, live streaming, and personal capture. Echo360 also provides hardware for onsite video capture. While Echo360 is a strong player in higher education, their focus on CME will likely bring special value to continuing education providers in the healthcare associations and academic medical center space. However their feature set seems a bit more limited than other enterprise video providers for continuing education. Haivision provides hardware and streaming for live and on demand video. Features of note include live streaming and recording of up to 50 sources simultaneously and SSO. They list a number of education customers on their website, but the features listed on their website don’t stand out from the competitions. Kaltura has an overwhelming number of options and features. With lots of APIs, plugins, integrations, and developer options, Kaltura is a good fit for large organizations with many requirements for video and the resources to deliver them. Most interesting to continuing education are the content entitlement features that can integrate with a single sign options. The syndication and monetization feature may be of interest to those organizations interested in selling and syndicating their content. Kaltura also provides lecture capture and live streaming features for live meetings. MediaPlatform started with a focus on live streaming, but now provides on demand video as well. Features of interest to healthcare continuing education providers include custom course templates that feature PowerPoint slides, pre-recorded video, Q&A, chat, polls, surveys and downloadable files. MediaPlatform allows for multiple remote instructors with learners viewing on desktop, tablet or smartphone. Live courses are automatically archived for use as enduring materials. MediaPlatform provides integrations with LMSs, although the supported systems are targeted to human resources rather than continuing education. MediaPlatform also offers full service live meeting webcasting services. Panopto targets education and business and calls itself the video platform for training, teaching, and presenting. From their history as a lecture capture vendor they have strengths in video capture, as well as video search and usability. Features include Panopto-certified video capture appliance for classroom capture, live webcasting, screen recording, video content management and interactive video including quizzes. Video search and search federation may be of use to healthcare continuing education providers with multiple properties. Integrations include multiple vendors, LMSs and an API is available. Panopto seems to have decided to focus on training and education and their application offers a streamlined user experience that should be of interest healthcare continuing education providers. Vbrick’s Rev media platform offers features such as live webcasting, video content management, analytics and more. Their website was a bit light on detail, but they are a popular enterprise video vendor and their product is resold by Cisco. While Rev has an available API, their pre-built integrations are limited and may not meet the needs of healthcare continuing education providers. Vidizmo targets education and healthcare specifically. They are one of the few two video providers in this list to market to CME providers. Their enterprise video portal offers features such as white labeling, API, interactive authoring, a branded portal, moderation workflows, lecture capture, live and on-demand streaming. Vidizmo integrates with enterprise SSO and has less common features such as SCORM publishing and Powerpoint slide syncing. Overall Vidizmo looks like a very strong contender for an enterprise healthcare education video hosting platform for healthcare continuing education organizations. Vzaar claims it has “ The best quality video playback, anywhere in the world, on any device” and targets education as a primary market. Plans are available for as low as $25 a month, but an education provider will need the premium or enterprise plan to take advantage of features such as API access, additional users and other features. Overall Vzaar seems to be offer a strong, but limited set of features at reasonable pricing point. They seem to be a middle point between our lower-end video providers and the other enterprise providers listed here. Warpwire is a video platform targeted specifically at education. Warpwire provides features important to healthcare continuing education such as easy integration with learning management systems, LTI plugins, single sign on (SSO), and a strong API. Interactivity is provided via partner integrations. SSO integration includes learners and access can be given on a per-user per-video basis. There are no ad or monetization features, but analytics are provided. With fewer overall features, but targeted toward education, Warpwire appears a bit easier to use and may be a good fit for associations and academic health centers not needing a big feature set. 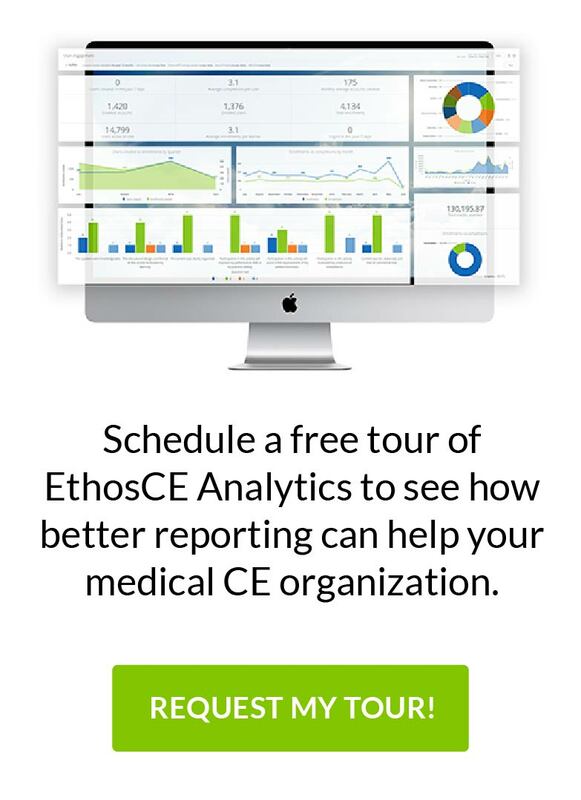 For more information about continuing education for healthcare associations and academic medical centers, contact us today for a free demo of EthosCE, the award-winning learning management system for continuing education.